Mature apple tree in full bloom. After working hard to plant and nurture your fruit trees, it can be very discouraging if you are not soon rewarded with a bountiful crop of delicious fruit. Since many fruit trees can take up to 5-6 years (or more) before they are old enough to bear, problems with fruiting may not become evident right away – which is even more frustrating. There are several reasons why fruit trees fail to bear; but one of the most common is lack of pollination. If the flowers are not pollinated, fruit cannot develop (in most cases). What leads to pollination problems? Japanese plum blooms in spring. 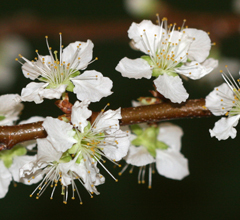 Many fruit trees, for example apples, pears, sweet cherries, and many plums, require cross-pollination in order to set fruit. 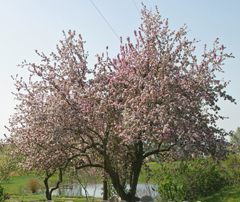 If you are growing these types of fruit trees, you must have at least two compatible varieties planted within 50 feet of each other in order to ensure successful pollination. Compatible varieties are those that are in bloom at the same time and have compatible pollen. For instance if you want to grow Gala apples, you will need to plant at least one other variety, such as Braeburn, Fuji, or Granny Smith, as a pollenizer. These are just a few of the many apple varieties that would successfully cross-pollinate Gala. In fact, most apple varieties have quite a number of different trees that can act as a “pollination partner” – you just need to do a bit of research. 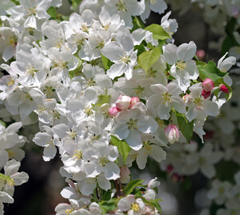 Even crabapples will meet the pollination requirements of many apple trees. Almost all varieties of pears require cross-pollination. Even more specifically, Asian pears require another compatible Asian pear for pollination and European pears require another European pear as a pollination partner. These two pear types cannot cross-pollinate each other. This is also true of Japanese and European plums. How do you find a compatible variety? Sometimes the pot tag will recommend a pollenizer or the nursery staff where you purchase the tree can suggest compatible trees. If you purchase from a mail order company, their catalog or website will suggest the best pollination partners for a particular variety. This holds true for all fruit trees that require cross-pollination. Some fruit trees are self-pollinating or self-fruitful, meaning they can set fruit without cross-pollination with another variety. These include most varieties of peaches, apricots, nectarines, and sour cherries. 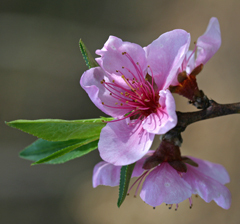 In the case of self-pollinating fruit trees, only one tree has to be planted in order to get fruit. However, most of these trees will bear more reliably or produce heavier crops if more than one variety is planted. Cross pollination will usually improve fruit set. This may explain why we have never gotten apricots on our solitary apricot tree even though it is hardy in our area and is supposed to be self-pollinating. It blooms beautifully but only a few fruits form and these always drop off when they are quite small – sounds like a pollination issue to me. Of course there are other reasons why fruit trees may fail to produce fruit. Environmental conditions can affect fruit set in some years. A very cold winter can damage or kill the dormant flower buds. This is especially common when fruit trees are planted on the fringe of their hardiness range. Obviously, this will result in few or no flowers the following spring. Late spring freezes or frosts just before or during the bloom period can damage or kill the flowers before pollination occurs. Misty, rainy, or cold weather at the time of flowering can inhibit or limit pollination because bees are not as active in these conditions. If weather like this persists, it can affect pollination and result in a reduced fruit crop. Poor nutrition due to lack of fertilizing. Espoma Tree-tone is a good organic fertilizer for all fruit trees. Apply in the early spring before growth begins and in the fall after the leaves drop but before the ground freezes. weaken and eventually kill apple trees. Disease or insect damage to flowers or flower parts can prevent successful pollination. Spray in late winter with a horticultural oil such as Bonide All Seasons Oil and follow a recommended spray schedule through the growing season. 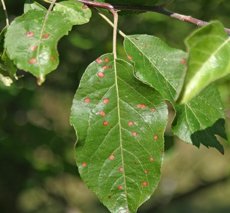 Trees are weak due to repeated disease problems, insect infestations, or poor care. Before you purchase your fruit trees, be sure to do your research! Choose varieties that are hardy in your area. If cross-pollination is required, choose two or three varieties that are compatible and will successfully cross pollinate each other. 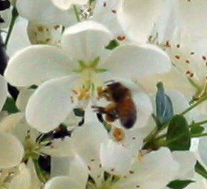 Remember that even self-pollinating varieties will benefit from cross-pollination. Keep your trees properly fertilized and watered. Prune your trees according to the training system recommended for each particular fruit type.